The AL-ROCK allows large and complex components and tools to be processed in situ. The AL-ROCK combines the efficiency of a diode laser system with the flexibility and dexterity of a 6-axis robot arm. Laser system and arm are mounted on a self-propelled crawling chassis allowing the technology to be taken directly to the component or tool and the laser hardening process carried out directly on the part to be hardened. For automotive manufacturers the AL-ROCK can generate significant cost savings by reducing the time a press is out of action. The cost of stoppages in a volume car plant can run into tens of thousands of pounds per hour. With this mobile system, work can begin at short notice with minimum downtime, using a hardening process that is both fast and efficient. 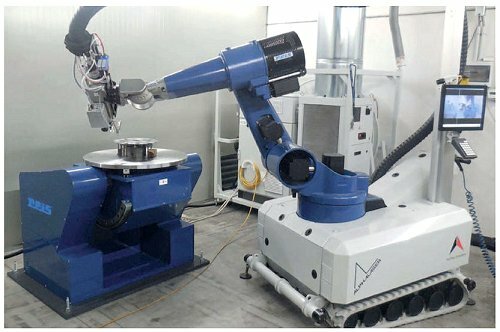 The extensive horizontal reach of the robot makes it possible to cover the large areas and complex shapes associated with automotive press tools. Although the system is designed to be mobile, it can also operate as an off-line laser hardening cell. This BLOG is a shortened version of an article that appears in the latest edition of Laser Systems Europe. To access the full version, please go to Laser Systems online magizine.